Some of the functions of Zinc are enzyme activation, pH regulation and the formation of chlorophyll. Zinc deficiencies will have a detrimental effect on the size, structure and development of plant cells. High levels of soil P and high soil pH are commonly responsible for Zinc deficiencies. 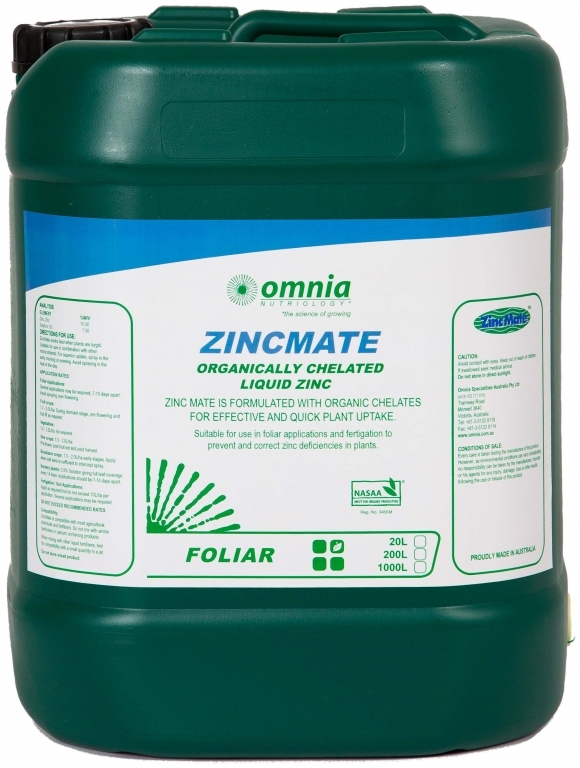 ZincMate will effectively correct Zinc deficiencies in plants. Effective correction of plant Zinc deficiency. Several applications may be required, 7-10 days apart. Avoid spraying over flowering. 1.0 – 2.0 litres/ha during dormant stage, pre flowering and fruit fill as required. 1.0 – 2.0 litres/ha as required. 1.0 -2.0 litres/ha pre-flower, post fruit set and post harvest. 1.0 – 2.0 litres/ha. Early stages. Apply when leaf area is sufficient to intercept spray. 0.5% Solution giving full leaf coverage every 14 days. Applications should be 7-14 days apart. Apply as required but do not exceed 10 litres/ha per application. Several applications may be required. Do not exceed recommended rates. When mixing with other liquid fertilizers, test for compatibility with a small quantity in a jar. ZincMate is a NASAA-Certified organic product of choice.